Obesity is one of the greatest health threats to society today. So many people are eager to shed unwanted weight that they are willing to try things that actually do more harm than good. Dr. Tei-Fu Chen, the founder of Sunrider and creator of over four hundred herbal health products, has given us some valuable advice in the past. Now, he has plenty to say about why some popular weight loss strategies do not work. Some weight loss products rely on ingredients your body cannot digest well with the theory that these substances will take up room in your stomach so there is less space to consume calories your body can digest and thus lose weight. Initially, people may experience some weight loss, but eventually the body’s natural eating habits will urge the person to consume the same caloric intake it is used to eating. Now you are left adding the volume of food required to meet your normal caloric intake, the volume of indigestible “weight loss” product, and are increasing your volume intake. As your volume intake increases, your stomach has to stretch to accommodate the increased volume. When a person stops taking the weight-loss product, they are left with an expanded stomach that has the capacity to hold even more food before feeling satiated. This becomes a vicious cycle: the stomach stretches out, your waistline expands, the larger stomach volume requires more food volume (calories) to feel satiated, and you gain more weight. This vicious cycle is a struggle for many people looking to lose weight. They lose a little weight only to gain it all back. Another widely used approach is using medication to reduce your appetite. It works on the brain to depress you so you don’t want to eat anything. Unfortunately, what most people don’t realize is you end up eating more food, not less. Ask yourself, do you eat more food or less food when you are feeling depressed? Yes, the medication may help a person eat less during dinnertime, but feeling depressed all day may cause people to snack in between their main meals, thus eating more calories throughout the day than if they just ate according to their normal habits. And then there are those who combine a rigorous exercise regimen with dangerously low caloric intake and a nutritionally imbalanced crash diet to reach their weight-loss goal faster. This group will realize later they have damaged their metabolism while ultimately gaining back all, and possibly more of the weight they worked so hard to lose. Simply put, we forced our bodies to accept a larger quantity (and nutritionally poorer quality) of food than what our bodies need to function optimally. Gradually our bodies became used to these bad habits. How to Naturally Break this Bad Habit? 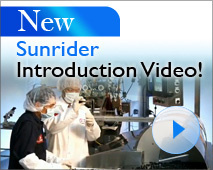 For over 30 years, Sunrider has remained firm in its belief that the human body is a complex machine with the inherent ability to care for itself if given the proper quantity and the right balance of nutrition. That's why they have been a leader in the creation of naturally effective health and beauty products since 1982! We refer to this point of view as the Sunrider Philosophy of Regeneration. 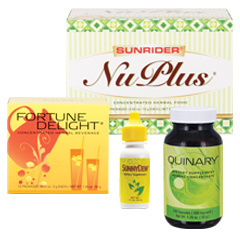 Try Sunrider's new naturally effective formula, SunTrim Plus. Follow our daily Natural Weight Loss Plan.